Abarca-Olivas, J (1); Monjas-Cánovas, I (2); Bartschi, P (1); Moreno-López, P (1); Gras-Albert, JR (2); Lloret-García, J (1). With the current endoscopic surgery development, surgical approaches to lesions located in the sellar and suprasellar region have progressively changed over the past few years. The classical intracranial or micoscopic endonasal approaches have been substituted for a purely endoscopic approach. That is why, it is of crucial importance that the neurosurgeon masters the anatomy of this region from both endonasal and intracranial perspectives. For this reason we have prepared anatomial dissections from both views in order to correlate the most important landmarks. The dissection was performed without endoscopic tools and the pictures were taken with a conventional reflex camera. Therefore, a coronal cut at the level of the posterior half of the maxillary sinus and the lamina cribosa has been performed. The following sections will show the progressive endonasal dissections views step by step. Stage 1: Nasal cavity and paranasal region. Anatomical relationship between paranasal sinuses, turbinate (or concha), the orbit and the anterior cranial fossa. CP: cribiform plate; EB: ethmoidal bone; IT: inferior turbinate; MS: maxillary sinus; MT: middle turbinate; O: orbit; SN: septum nasal. Right pterygopalatine fossa dissection after removal of the ethmoid bone, the middle and inferior turbinate. The superior turbinate has been preserved. Observe how the right optic nerve is part of the Onodi’s cell (or sphenoethmoidal air cell that includes the optic nerve tract). CHO: choana; DPA: descendent palatine artery; DPN: descendent palatine nerve; EER: spheno-ethmoidal recess; FR: foramen rotundum; IN: infraorbital nerve; MA: maxillary artery; ON: optic nerve; SPA: sphenopalatine artery; ST: superior turbinate; VN: vidian nerve. Relationship between the sphenoid ostium and the superior turbinate tail. OS: ostium sphanoidale; ST: superior turbinate. Picture of the vomer (V) articulation with the sphenoid rostrum (RE) after removal of the superior turbinate. Picture of the anterior sphenoidal sinus after the removal of the turbinate and the nasal septum. We can see both of the sphenoid ostium on each side of the midline. The right pterygopalatine fossa has been dissected, while on the left side it has been maintained intact. CP: cribiform plate; RE: rostrum sphenoidale; RG: rectus gyrus of the frontal lobe. 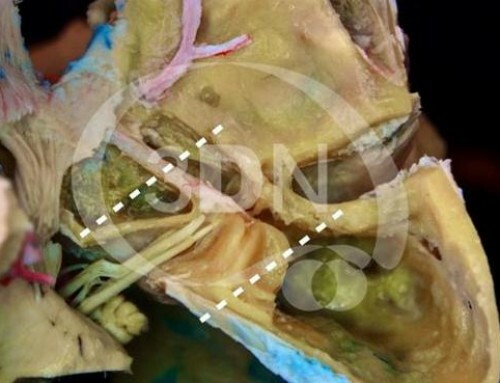 We can appreciate the sphenoidal sinus interior after removal of half of the right sphenoid rostrum. We can see some of the principal intrasphenioidal sinus landmarks. CR: clival recess; ICA: internal carotid artery; ON: optic nerve; SF: sellar floor. The entire anterior sphenoid wall has been removed. We can identify an intrasphennoidal septum that projects to the lateral left portion of the sellar floor. Variability in pneumatization and in sphenoidal sinus septum anatomical shape are well known. CR: Clival recess; ICA: internal carotid artery; PS: planum sphenoidale; ON: optic nerve; SF: Sellar floor; SPF: Sphenoidal floor; SS: Sphenoidal septum; TS: tuberculum sellae. The sphenoid septum has been surgically drilled. We can then appriciate a general anterior view of the sphenoidal sinus. The relationship between the pterygopalatine fossa and the sellar and parasellar structures can be represented as an imaginary letter ”H” where the intersections would correspond to the vidian canal. The vertical lines would project from both of the pterygoid at the bottom up to the parasellar internal carotid arteries at the top. The horizontal lines would correspond to the sphenoidal sinus floor that constitutes the roof for both choanae. Sellar and parasellar view after surgical bone drilling. 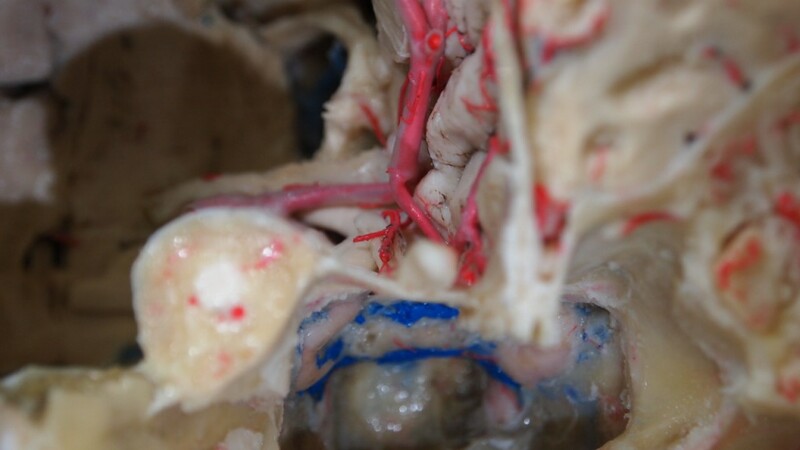 We can observe a dural layer spreading across both cavernous sinuses. CP: cribiform plate; CR: clival recess; ON: optic nerve; PCCA: paraclinoidal carotid artery; PClCA: paraclival carotid artery; PSCA: parasellar carotid artery; PS: planum sphenoidale; SF: Sellar floor; TS: tubercullum sellae. 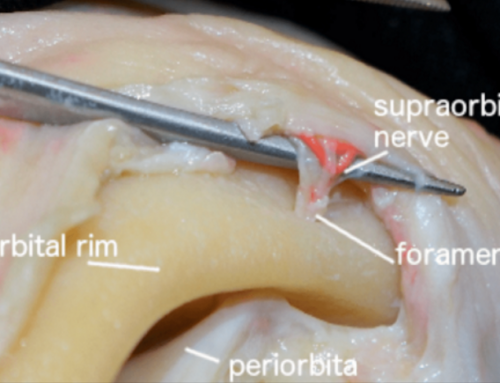 The dural layer has ben removed from the sella turcica and from the cavernous sinuses. 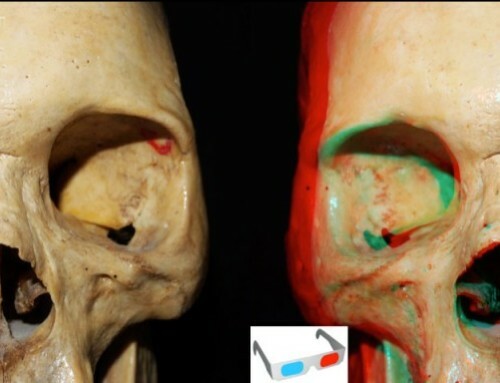 Now we can see the superior and inferor intercavernous sinuses localization. IICS: inferior intercavernous sinus; PG: pituitary gland; SICS: superior intercavernous sinus. An intracranial dissection of the sellar and parasellar region has been performed after extraction of the right cerebral hemisphere. Intracranial superior view of the right sellar and parasellar region. AC: anterior clinoid process; ICA: internal carotid artery; LT: lamina terminalis; ON: optic nerve; OlN; olfatory nerve; SW: sphenoid wing; TS: tubercullum sellae. Intracranial view. An intradural clinoidectomy has been performed. As you can see, the paraclinoid segment of the internal carotid is exposed between the proximal and distal dural ring. In this case, the clinoid, besides his anterior process and the optic strut, presented also a union with the middle clinoid process. DDR: distal dural ring; MC: middle clinoid; OS: optic strut; PCCA: paraclinoid carotid artery; PDR: proximal dural ring. Endonasal view. The internal carotid paraclinoid segment is in contact with the optic nerve. In endonasal surgery, the medial point of this contact is called the medial optic-carotid recess. The intracranial projection of an instrumental probe. Here , the location of the tuberculum sellae from an endonasal view is shown. The intracranial correlation aims directly at the most anterior part of the optic chiasma. Endonasal view. On this picture, dura from the tuberculum sellae has been removed and partially removed from the planum. The pre chiasmatic cistern and its content can therfore be apreciated. Ch: Chiasma; CR: clival recess; mc: middle clinoid; OA: ophtalmic artery; ON: optic nerve; PCCA: paraclinoid carotid artery; PClCA; paraclival carotid artery; PG: pituitary gland; PSCA: parasellar carotid artery; SHA: superior hypophyseal artery. Endonasal view. Now we are displaying the lateral optic recess localization. It has a triangular shape made of the optic nerve superiorly, the paraclinoid segment of the internal carotid artery medialy, and the superior orbital fissure laterally and inferiorly as shown with the red circle. Intracranial view. The exit extremity of the intracranial probe tool correponds to the optic strut of the anterior clinoid recess, that has been removed in this case (red circle). Again, we can see the relationship between the internal carotid artery and the superior orbital fissure. Therefore it can be said that the lateral optic recess(l-or) is the endonsal projection of the optic strut. That is the reason why a clinoidectomy would produce a CSF fistula leak through the nose. Endonasal view. Here the instrumental probe is showing the relationship between V1 and V2. FR: foramen rotundum; ION: infraorbital nerve. Intracranial view. Anteromedial triangle (V1-V2). APCL: anterior petroclinoid ligament; DC: Dorello’s canal; GG: gasserian ganglion; ICA: internal carotid artery; ON: optic nerve. Endonasal view. Now the instrumental probe is looking for the V2-V3 space. Endonasal view. In this case we are searching the Meckel’s cave direction from the endosanal view. We go through the most proximal V2 part and the paraclival carotid artery. Intracranial view. Meckel’s cave cannot be seen fronm an intracranial view because it is covered by the Gasser’s ganglion. Intracranial view. If we cut through the trigeminal trunk and move it anteriorly , we can see the instrumental probe. 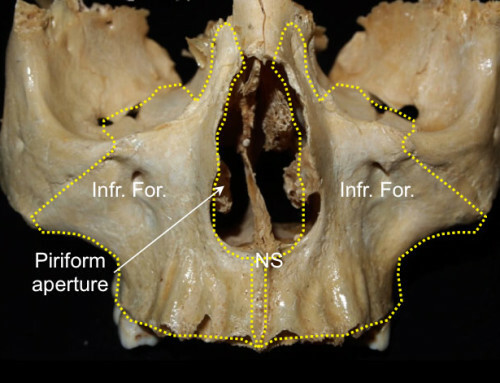 Besides the Meckel’s cave we can also see the superior part of the foramen lacerum and the carotid artey trajectory , called lacerum carotid artery (LCA). At that level , the petrolingual ligament (PLL) is covering the carotid artery. 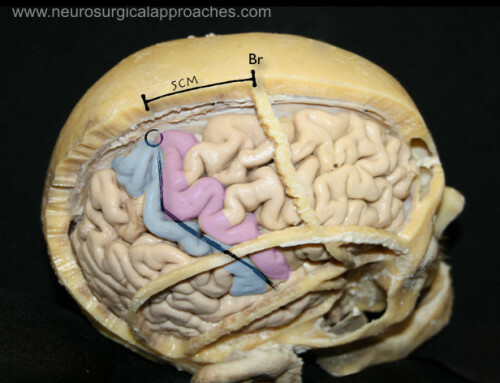 And if we go beneath the Dorello’s canal towards the cavernous sinus we see the VI th cranial nerve. We can clearly distinguish the greater petrosal nerve trajectory over the lacrum carotid artery (LCA). Retroselar space: prepontine, interpeduncular and crural cisterns. Endonasal view. In this picture the upper and middle clivus has been removed. The prepontine cistern is exposed. The basilar artery and the anterior view of the pons are below and behind the pituitary gland. Endonasal view. The pituitary gland has been removed to have a better view at the interpeduncular cistern and its content. BA: basilar artery; Ch: chiasma; I: infundibulum; MB: mamillary bodies; PComA: posterior communicating artery; SCA: superior cerebellar artery. Endonsasal view. In this case the instrument is looking for the right crural cistern. Intracranial correlation. The yellow circle shows the trajectory of the instrumental probe at the level of the crural cistern. The third cranial nerve exits the interpeduncular fossa between the P1 and the superior cerebellar artery.